Editor’s Note: Uechi Ryu Karate is a powerful, hard Okinawan style, which originated in China. It was brought to Okinawa early in this century by Kanbun Uechi and shares many similarities with Goju Ryu karate and the lesser Naha-Te styles of To'on Ryu and Ryuei Ryu. Uechi Ryu is characterized by upright stances, circular blocks, grabs, open hand and one knuckle techniques plus low kicking, often using the big toe. Uechi-ryu is one of the most popular styles of Okinawan Karate-do practiced today. It enjoys not only a large following in Okinawa and Japan, but throughout the world, especially in the United States. Interestingly, there is very little written information in English outlining the history, training methods and philosophy of Uechi-ryu Karate for English speaking practitioners of the style. These two pioneering works by George Mattson provided the first detailed information for English readers about his Uechi ryu karate. 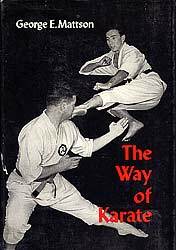 Two earlier books outlining Uechi-ryu, "The Way of Karate" (1963) and "Uechi-ryu Karate-do" (1974), both written by George Mattson, introduced the Uechi style, history and training methods for the first time to the English speaking public. Indeed, during the 1960's and 70's these pioneering works were some of the few English language sources of information regarding Karate for the general public. Although a welcome addition to students of Uechi-ryu at the time, these books had some serious shortcomings which eventually came to light. Among these were some historical inaccuracies with respect to the history of the style and mistakes in the Kata and terminology presented in the books. 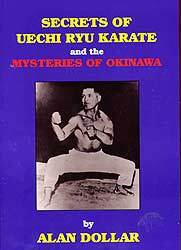 This was remedied somewhat by Alan Dollar's (1996) English language text for Uechi-ryu students entitled, "Secrets of Uechi-ryu Karate and the Mysteries of Okinawa." But even with this welcome and much needed addition, information on Uechi-ryu was still pretty scarce. With this in mind, I'd like to try to give a somewhat different account to what is usually found in English language books on Uechi-ryu history and its founder Uechi Kanbun. Uechi-ryu karate is one of the most recent imports to the Ryukyus in terms of fighting arts and was founded by Uechi Kanbun (1877-1948). Kanbun grew-up on the Motobu peninsula of Okinawa under the watchful eye of his father. Although his family was 'shizoku' (noble family), they worked as farmers. During Uechi Kanbun's teenage years, it was a fashion of that era to perform "karate and bo dances" accompanied to the music of the shamisen (Kinjo, 1999). More than likely Uechi Kanbun was familiar with these dances and they may have served as a means to inspire his martial studies (Kinjo, 1999). Kanbun gained some formal training in karate and bo techniques from a man named Touichi 'Tanmei' (lit. 'old man'; a term of respect). But his resolve to study the fighting arts in China was inspired by stories of Chinese masters told to him by a martial artist named Toyama. So, in March 1897, at the age of nineteen, Uechi Kanbun left Okinawa for Southern China. Kanbun Uechi left Okinawa by sea to travel to the city of Fuzhou (right, Ca. 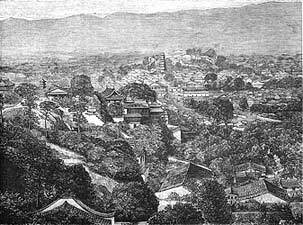 1870s) in Fujian Province in China. This coastal trade city is located on the mainland of South China. Off shore lies the island that is known today as Taiwan. Traveling the East China Sea can be tricky. It is racked by storms and high seas. Typical craft plying the trade routes to China from Naha, Okinawa were small sailing craft as pictured here. Kanbun could have traveled on such a craft. Kanbun arrived in Fuzhou City, Fujian province, Southern China and like many Okinawans before him (Higashionna, Kinjo, Nakaima, etc.) 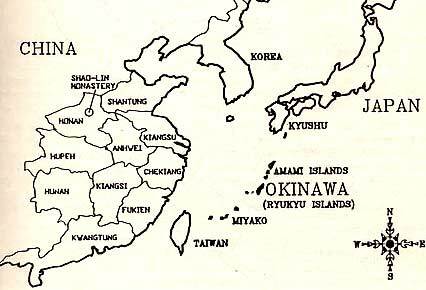 Kanbun reportedly settled in at the Ryukyukan (Kinjo, 1999), a Okinawan enclave of buildings including a boarding house, homes and businesses established for those who visited and lived in the area including migrant workers who came to Fujian seeking employment. Uechi Kanbun started working at a variety of different jobs and began practicing at the Kojo dojo, run by the Kojo family located next to the Ryukyukan (Kinjo, 1999). Unfortunately, it has never been ascertained exactly what form of boxing was taught at the Kojo dojo during that era. 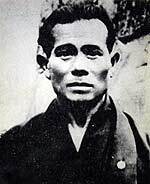 Kanbun trained as hard as he could until one eventful day when the head instructor of the Kojo dojo reportedly called him "Uechi no wada buta gwa" ('little fool'). Slighted by the insult, Kanbun decided to leave the Kojo dojo and the Ryukyukan to find his studies elsewhere. Uechi's martial studies can be documented with some degree of accuracy up to the time he left the Kojo dojo. After he left, however, it becomes somewhat difficult to determine which direction his martial studies took. Oral tradition states that Uechi eventually became the student of Zhou Zhi He to further his studies of Chinese boxing, but it is not known how it came about. Reportedly, after Kanbun left the Kojo dojo he entered the Fujian / Fuzhou central Buddhist temple. And it was there that Uechi was introduced to Zhou who was reportedly the 36th generation head of the temple (Kinjo, 1999). However, according to research conducted by the Uechi-ryu Karate-do Kyoukai several years ago, there was no such temple (Kinjo, 1999). Where then did Uechi meet Zhou? Unfortunately, no definitive conclusions can be made and this is still the source of much speculation. 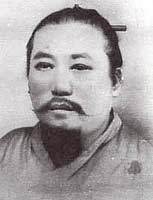 Kanbun Uechi’s Chinese teacher Shu Shi Wa also known as Zhou Zhi He. Uechi's teacher, Zhou Zhi He (1874-1926) (more commonly referred to in Japanese as Shu Shi Wa), was a bit of an enigmatic figure and there is little factual evidence about him. 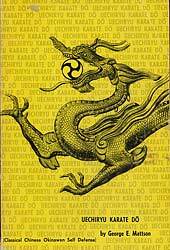 It is known that Zhou originated from Minhou, Fujian and was a civil boxing teacher (McCarthy, 1999). He reportedly studied martial arts under Li Zhao Bei and Ke Xi Di and was proficient in a variety of quan'fa. Still other sources state that Zhou learned from Chou Pei and Ko Hsi Ti (Cook, 1999). Zhou reportedly practiced Crane and Tiger boxing, in addition to hard and soft qi gong (also spelled chi kung -- the study and practice of internal energy) and was noted for his iron palm technique. Besides Uechi Kanbun, his students included Jin Shi Tian, Wang Di Di and Zhou Zheng Qun (McCarthy, 1999). It has also been speculated that Wu Hien Kui (Jap. Gokenki) was also a student of Zhou. In contrast to this Zhou has also been described as a Taoist priest and a master of Chinese boxing, who taught among other styles his family system of quan'fa (Breyette, 1999). In addition to his training in quan'fa, Uechi's training with Zhou also included the use and preparation of herbal medicines (Breyette, 1999; Kinjo, 1999). In fact, one medicine still in use in some Uechi-ryu karate dojos is known as "Uechi Guza" in Okinawa hogen (dialect) or "Uechi Kusuri" in standard Japanese (English: Uechi medicine) and is used for healing bruises and cuts associated with training. After eight years of continuous training under Zhou, Uechi Kanbun reportedly received his teaching license in "pangainoon" quan'fa in 1904 at the age of 27 (Kinjo, 1999). He was then granted permission to teach, and opened his first school in Nansoue, about 250 miles Northwest of Fuzhou where he taught for nearly three years (Breyette,1999). During his time in Nansoue, Uechi Kanbun's life was for the most part uneventful. He taught quan'fa and sold herbal medicine to the local people of that area for several years until an unfortunate incident occurred which changed the course of his life. One of Kanbun's students reportedly had a dispute with another man over a farming issue. Sadly, Kanbun's student struck a blow to the other man, killing him (Breyette, 1999; Kinjo, 1999). However, there is speculation that Uechi Kanbun himself may have been involved in the dispute directly and may have delivered the fatal blow (Dollar, 1996). Be that as it may, whoever struck the final blow also struck the final blow for Uechi Kanbun's life in China. Feeling somehow responsible for the man's death, Kanbun closed his school and left China for Okinawa, vowing never to teach quan'fa again. The year was 1910 (Breyette, 1999).